I remember when I was a kid, getting a toy airplane. I took it outside, flew it for about 40 seconds and then watched as it clipped a tree, watched it spiral into the pavement, and I ended up back in my house playing with my action figures. Wing Era sorta gives that feeling of playing with your toys again, but it simplifies and ups the intensity. 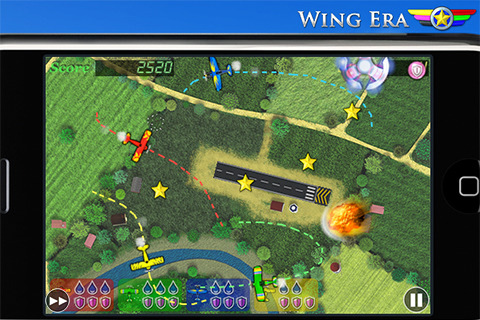 Wing Era is a plane flying, plane guiding, top-down collecting game. You guide a plane around, avoiding enemies, collecting stars and managing your fuel. 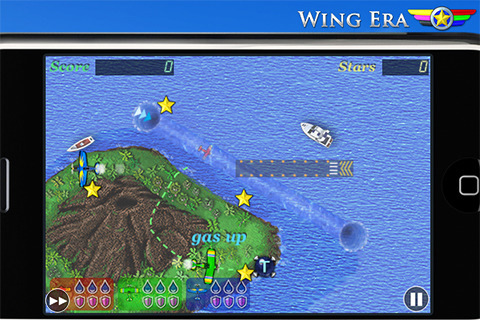 Released by MintBase, Wing Era is available on the iPhone, iPod, and iPad for $0.99. You drag your finger from the plane to some destination and your plane will automatically follow. Now as simple as that sounds, add 3 planes that you want to keep alive, an army of other toys like floats, meteors, and UFOs, and try to manage that. I’d like to make clear that despite this review, the game itself never proclaims that their planes are toys… but it’s my first impression. The art is cartoony with black outlines around the planes, powerups, and stars floating around. To me, it feels like a toy plane management game. The graphics are solid. The backgrounds in the top-down view have great details on some levels and they all have different appearances and themes. It’s pretty overall and the user interface is pretty good since everything is easy to read and understand. The gameplay requires that you collect stars to gain points and you have to refuel constantly. To do this, you drag your finger from the plane, make a path, and if your path lands you on the platform’s edge, you’ll refuel after a short animation. You can also have access to a car later that requires itself to be parked in order to refuel. Controls are actually better than most in terms of path-drawing games. Here, you can interrupt your movements by dragging a new path. Your plane can make some impressively sharp turns and correct itself to evade or collect a star. It works much more intuitively than other games I’ve played using this control scheme. There are some oddities that appear in the game. For one, the sound doesn’t seem to lower when I have my volume down. It will be at full blast or just off. There are typos and grammatical issues in the tutorial, which isn’t a serious thing (I mean, look at my reviews, lol) but it could easily be fixed. The strangest glitch is in the pause menu. When you play the game, you will ALWAYS hold the speed up button because the plane itself moves at a frustratingly slow pace. Speeding it up is a good thing. So if you pause the game and touch the speed up button or never let your hand off of it like I did, the game will start playing with the big ‘Pause’ text on the screen. I collected 3 stars with the giant Pause text on the screen and then decided it was too obstructive and unpaused. Overall, despite a few issues, the game works and is entertaining. I found myself getting frustrated on certain levels due to how difficult it was to control 3 planes at the same time, but it was interesting and played well. If you find yourself having any amount of interest after reading this, then go and try it for yourself. It only costs a dollar at the time of writing. AppSafari review of Wing Era was written by Joseph Ho on October 20th, 2010 and categorized under App Store, Games, Line Drawing. Page viewed 3379 times, 1 so far today. Need help on using these apps? Please read the Help Page.